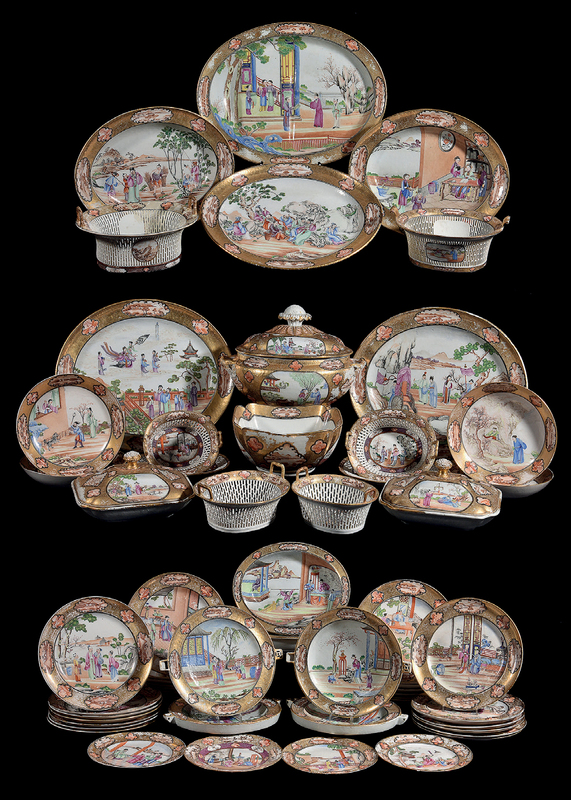 The complex design, enamelled in famille rose colours with figures at leisure on terraces, in pavilion interiors and in rocky riverscapes, was a favourite of American collectors in the 1930s, with John D Rockefeller Jnr the owner of an extensive service of this pattern. It sold as part of Christie’s massive dispersal sale earlier this year for just over $1m. 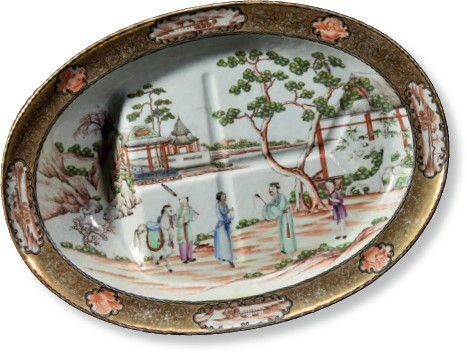 Two-part services of Palace ware were offered at Dreweatts (25% buyer’s premium). From a private family collection, they formed part of a large service of more than 140 pieces sold in Dublin on 1934 as part of ‘the valuable contents of Kilmoroney, Athy, Co Kildare, by direction of Sir Anthony Weldon, Bart’. The opening lot comprised 62 pieces. As well as 15 dinner plates, 14 dessert bowls and five side plates (some badly damaged), a number of service pieces were on offer including a large oval two-handled soup tureen, two canted rectangular vegetable tureens and covers and a series of oval pierced baskets. Despite the many condition issues listed in the catalogue, it flew over its £10,000-15,000 estimate to reach £115,000. The following lot of 28 pieces pitched at £3000-5000 took £44,000. Here 14 dinner plates and five dessert bowls were joined by large and small oval meat dishes, two oval baskets with stands, two food warmers and a tureen base.